Coming in and out of Canada/US may not be a burden for Canadians/Americans but the volume of people is really hard to endure. Any Canadian/American knows how long an immigration line could be during Holidays. I remember the time when Delta airlines used to have only one line for all flights going out of Toronto. This means that even if your flight is later than other people, you will have to line up with them. I actually had a first hand experience of this situation. I arrived at the airport 3.5 hours before my flight but due to the unsystematic line up the plane almost left me. I didn’t really bother to enrol at first since I’m not planning to go on a monthly out of the country trip. But unforeseen circumstances happen and having one became a need. So, the first question is.. – What is Trusted Traveler Program? It saves you time by skipping the long lines in immigration. Card holders are considered as low-risk and pre approved traveler. You’ll undergo background check -national identity, criminal records, and so on. It would take weeks for it to review the application. If you get cleared, you’ll get a conditional approval status and next step will be the interview. 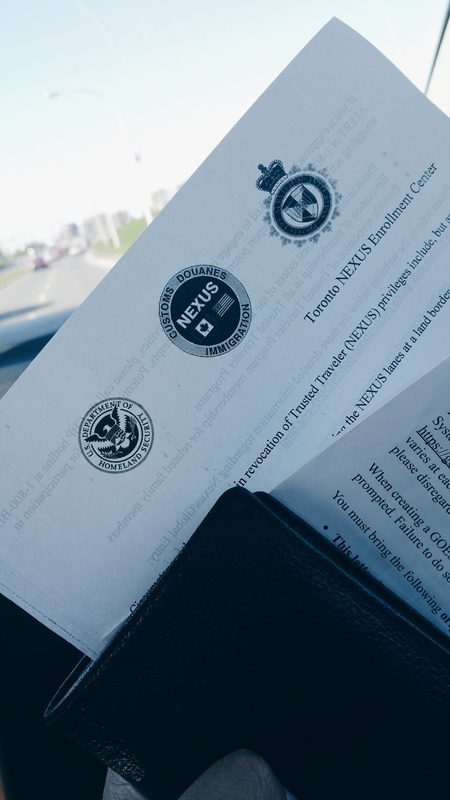 After successful interview, they will send you your global entry card that you could use whenever you travel either by land, by air, or by marine. If you’re traveling with a non-nexus person, you’re not allowed to use your nexus.